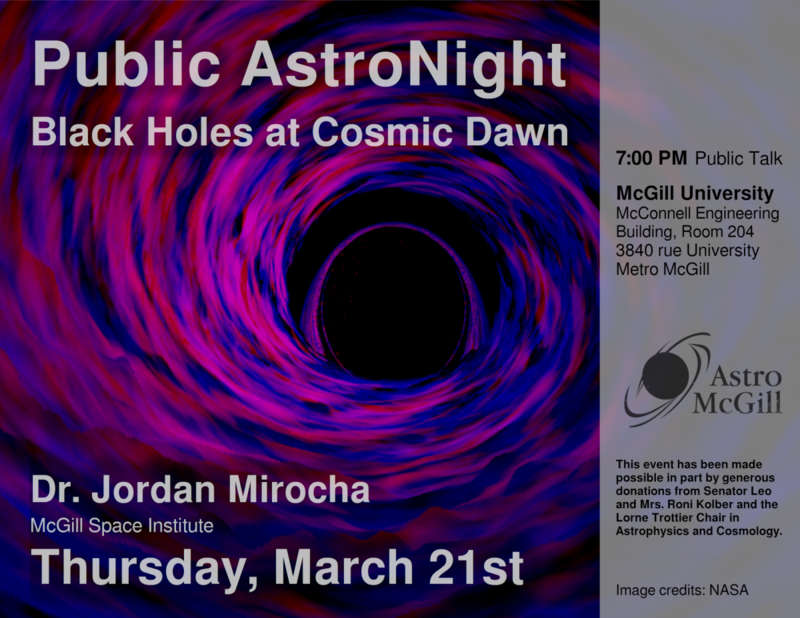 An AstroMcGill Public AstroNight public lecture by Dr. Jordan Mirocha (McGill Space Institute). Free and open to everyone - no knowledge of Astronomy expected. The lecture begins at 7:00pm sharp in the McConnell Engineering Building, room 204! The talk will also be live streamed, and we will try to take some questions from the online audience - the stream will appear on the AstroMcGill Facebook page when it starts. Abstract: Black holes with millions to billions times the mass of our Sun live in the centers of nearly all galaxies today. While interesting in their own right as the densest objects in the Universe, whose gravitational grasp not even light can escape, black holes are also at the center of many puzzles in astrophysics. In this talk, I will focus on a few of these puzzles, from the apparent correlations between black hole masses and the properties of their host galaxies to the observation that such "super massive" black holes already exist less than a billion years after the Big Bang. I will close by describing new ways astronomers are searching for black holes in the early Universe, and how such efforts may help resolve the outstanding challenges in understanding the cosmic evolution of black holes.